Sunday November 12 1911 It was frightfully cold. By & Millie could not come over Ida & I was not out of the house. We took care of the baby in the afternoon and Harry & Nellie went to a Musical recital Monday November 13 1911 Ida & I got a late start to ["Ravenwood"?] to see By & Millie Mrs. [Emmons?] kept us for lunch. We had a nice visit. The folk were to start east in the afternoon. We went down to Fields where we got some things. Stopped at John [Oriels?] for my traveling bag. [Zeta?] is sick so we could not go there. We got home at 5.30. It has been a very cold day. 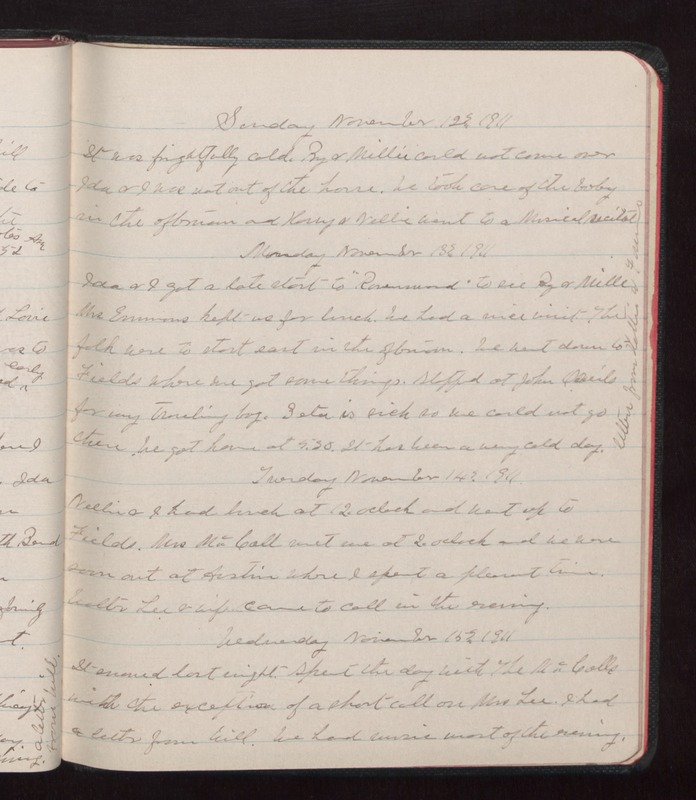 Letter from Hattie & Fannie Tuesday November 14 1911 Nellie & I had lunch at 12 oclock and went up to Fields. Mrs. McCall met me at 2 oclock and we were soon out at Austin where I spent a pleasant time. [Walter?] Lee & wife came to call in the evening. Wednesday November 15 1911 It snowed last night. Spent the day with the McCalls with the exception of a short call on Mrs. Lee. I had a letter from Will. We had music most of the evening.